How Important is Reducing Weight on a Bike? It seems the issue of saving weight on a bike can become a great side hobby for cyclists. For some reason cyclists can become quite obsessed with saving the odd gram here and there. I have a good friend in the US, who rarely cycles, is quite a few pounds overweight, but, will think of nothing about spending $100s to save 50g by purchasing a carbon seat post. Weight doesn’t matter on the Flat. If you are racing /riding on the flat, the weight of a bike, doesn’t make any difference once you get going. Apparently Isaac Newton proved this many centuries ago. In fact, when the world hour record was last broken, Ondrej Sosenka broke it using a disc wheel that was 3 times heavier than usual. The idea is that the heavy wheel acts like a fly wheel effect – the weight creating a momentum. The second thing to bare in mind is that a bike is likely to be only a small % of the total weight of you plus the bike. If you really want to make a difference to weight, try losing a few pounds from yourself. There is only so much weight saving you can get from a bike. Also don’t forget the most important thing is how fit you are, not how much your bike weighs. Gram per $. If you are keen to save weight try to compare the weight saving per $. Some changes are relatively useful, adding a carbon stem may save 200g and be relatively inexpensive. But, when it comes to upgrading from an Ultegra groupset to a Dura Ace groupset the weight saving works out to be very expensive. Another factor to bear in mind is that weight isn’t the only determinant of performance. For example, some wheels may be lighter at the expense of stiffness and rigidity. Ultra light wheels may be good for climbing but for average cycling give a worse performance. Also think twice before using ultra light track tyres on time trials. The weight saving may save you 0.1 seconds but is the 30% increased chance of a puncture worth the risk? I always race on good quality tyres with puncture resistance – I don’t like to gamble on using the flimsiest, lightest tyres. Also removing your front mech and using a single chainring may save 200g, but beware, if you do this your chain has an increased chance of coming off. 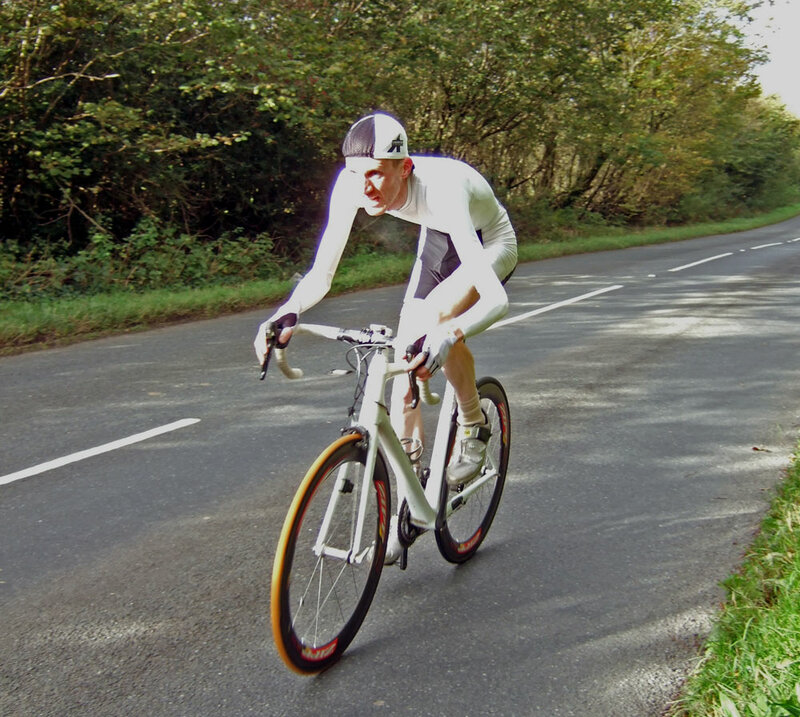 – I know it happened to a friend in the National hill climb championship. Moral of story – saving 100grams is not worth an even 1% chance of your chain coming off. If you watched a UK time Trial in the 70s and 80s ( I know its not exactly a spectator sport, but, it’s a hypothetical situation) you would see lots of the top testers who would have holes drilled into all parts of their bike. Brake leavers would be neatly drilled, resembling more like swiss cheese rather than a piece of cycling equipment. The funny thing is that all these holes probably didn’t help at all. Drilling holes can make it more difficult for the air to flow and this small aerodynamic drag is more significant than the weight saving, especially for UK time trials which are mainly on the flat. Although I mock others, it is something I have done myself for my hill climb bike. My interest in weight saving became an obsession when I got into the curious discipline of hill climbs. As far as I know, it is pretty much a UK speciality. Basically at the end of the season there are special races where you just time trial up a hill of varying length and gradient. Clearly in this kind of race, weight is going to be a big factor. I think my main reason for doing well in these races, is that I am naturally lean (read 3 stone under weight for my height.) Nevertheless, I still became fascinated in how I could save the odd gram. I would examine every single component and try and work out the cheapest way of doing it. From ultralight track tyres to cutting off half a brake lever I tried everything. The result was a bike like this. How Much does Weight Cost When Climbing? A saving of 1kg in weight would increase your time by 2 seconds. I was really shocked when I heard this. In my mind I had the idea that saving 100g would save you 2 seconds. It put it into perspective, maybe it would be easier to go 2 seconds quicker by spending more time training and less time working out ways to save weight. My friends says his method is very scientific, and to be honest from testing different weights of bikes it is believable. However, I would be interested if anybody else has some guides to time / weight. 8 Responses to How Important is Reducing Weight on a Bike? Last year at 78Kg (obese for my built) now reduced to 70Kg (still above ideal BMI of 22.9 = 62Kg). Dietition said to do it gradually for body to adapt to weight reduction. Regularly above 40Km/H each cycling trip (ever exceeded 50Km/H) with this 70Kg weight. At 78Kg, it used to be about 10Km/H slower (30Km/H… 40Km/H respectively). Looking forward to 50Km/H regularly and above 60Km/H occassionally, with further body weight reduction. I suppose that would put me into commpetition cycling level. I think it is hilarious that some cyclists will spend so much money for minuscule weight savings but don’t have a proper diet to stay at a lower weight. You can make larger savings % wise on your body than on your bike. Very true. I recently changed my diet and quite easily (with a bit of will power) I’ve lost 10kg in 8 weeks. Goes to show. The most difficult part is loosing body weight, many amateurs have many, if not more than 10 kgs overweight (like me), but the escapism of winning grams and especially chatting and surfing about it is fun. Am I right? Yes, good point for criteriums with lots of acceleration weight will be important. For a straight time trial not too important. I just checked your friend’s math and my numbers check out with his pretty well. Further though, if MY numbers are correct, that puts you right around the magical 7 W/kg . . . but since I don’t know how much you weigh the 7 W/kg actually includes the weight of you AND your bike (not just you alone the way a certain texan measures it). So, much respect from this side of the pond and nice blog I must say. Also, my philosophy is to not drill holes in anything you have to ride back down the mountain, no one’s bike ever killed them on the way up.